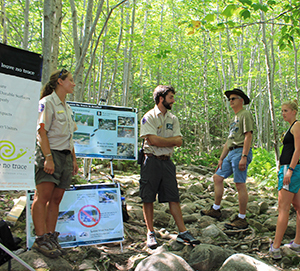 Summit Stewards are typically college-age students who serve as roving educators and researchers in the park. 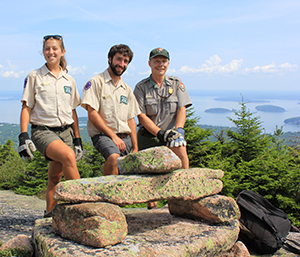 They are hired and trained by the park to spend the summer hiking Acadia’s trails, educating hikers in “Leave No Trace” principles, maintaining trail cairns, and carrying out trail censuses and other park research. The Rec Tech assists park staff in studying recreational use of the park. They maintain electronic trail counters on carriage roads and trails, use GPS to map and record condition of social trails and other sites of interest in the park, and administer visitor questionnaires and perform other routine monitoring and research tasks. Friends of Acadia has supported this program since 1997, when the positions were created and endowed. Originally called Ridge Runners the name was changed in 2016 when the Summit Steward and Ridge Runner Positions merged into one group. Open Summit Steward positions are generally posted in January or February for the following summer, at Employment Opportunities. When hiking on Acadia’s historic trail system, please “Leave No Trace” – walk only on the trail or durable surfaces, avoid stepping on or picking vegetation, and don’t modify trail cairns (or build new ones).